A prisoner caught with a needle in his cell claimed he was using it to run an illicit personalised greeting cards business. James Kidd said he used the needle and paint to create birthday and Christmas cards for other inmates at Perth Prison. 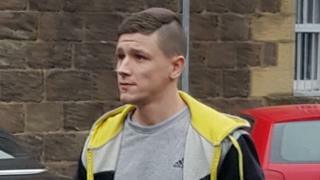 The 25-year-old from Leven admitted having a prohibited item within Perth Prison on 8 February last year. Kidd was jailed for eight months at Perth Sheriff Court. Depute fiscal Matthew Kerr told the court that the needle was discovered during a search of Kidd's cell. He said: "It was concealed in a trinket box on the counter beside the television." Solicitor Sandy Raeburn, defending, said: "The prison officers found paint which was being used as well. "He was making greeting cards. That was the reason for him having the needle. "He wasn't hiding it, as it was out on his tray. He complied with the prison staff." Sheriff Lindsay Foulis told Kidd: "You have numerous convictions for crimes of violence and convictions that show your respect for the justice system is not what it should be." Kidd appeared in court last month after admitting making a tattoo gun from a spoon, a guitar string, a pen, and a Playstation controller in the prison in December 2017.